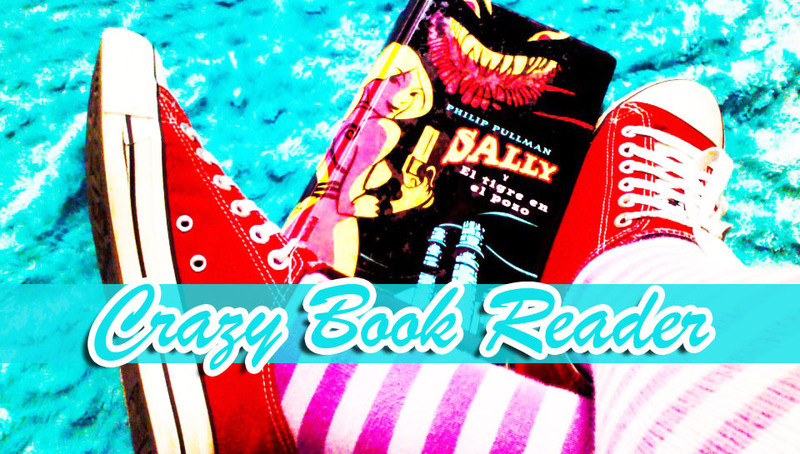 Crazy Book Reader: Edelstein (Ruby Red) Trilogy Review!! Edelstein (Ruby Red) Trilogy Review!! I love talking about this trilogy!! !, I read this books between 2011 and 2012, and I re read them about a week ago. 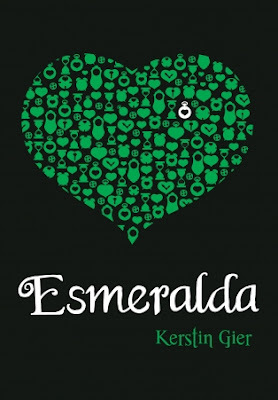 I'm talking about the Edelstein Trilogy of Kerstin Gier, an awesome german writer. 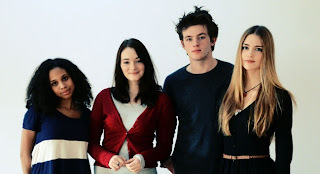 The saga is formed, if you lived in a hole and do not know yet, by Ruby Red, Sapphire Blue and Emerald. 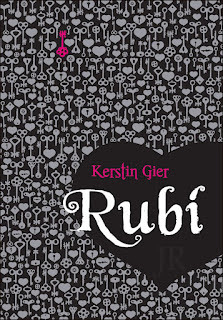 The first time I saw Ruby on sell was in a coffee shop, very famous in Mexico, and it didn't really , attracted me, because of the cover, the cover of the spanish version, for me was to grey and sad, so I didn't even think about buying the book. 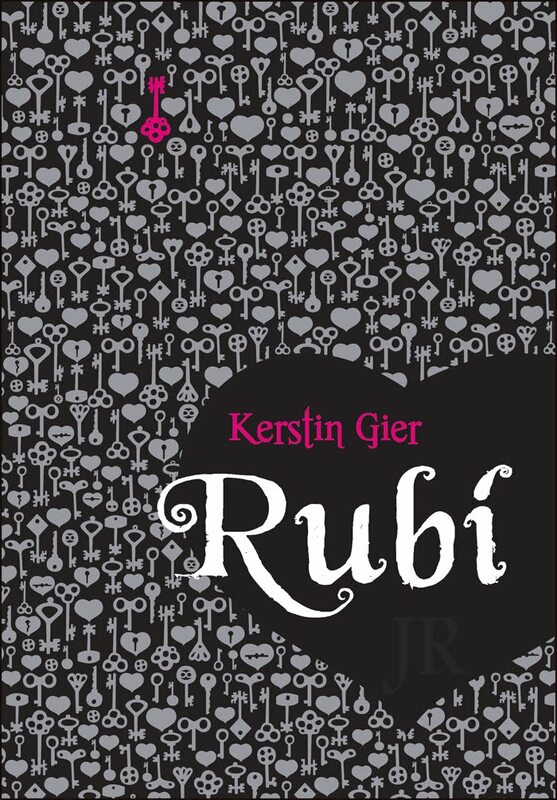 But later on, on the web I happend to found the german cover, and that art I loved, it is an awesome cover, so I ran back and get Ruby Red. I don't regret at all. It is an extraordinary book, full of fantasy, and love and advenures. 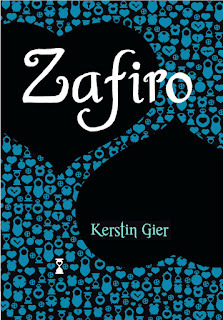 Because of its awesomeness it has been published in so many countries, so, you must read them. But first come first, maybe you will fall for this books with my review. Well, well it seems the blurb says it all, right? So why to read it if you know all the plot already. But there is so much and so many adventures in this book, beyond the obvious that, again, you can not miss. The story is set in London, which, like all novels set in London, gives it a mysterious and dense environment. Gwen is wonderful and friendly, this book is told in first person, Gwen tell us her story and all its adventures and does it in a so unique way that it will grab you from the start. Gwen is a 17-year-old student at a prestigious high school, is not the smartest of the class, not the least appreciated, is just a normal girl, which is happens to see ghosts and daemons or gargoyles (the spirits of the gargoyles guarding the ancient buildings), she has a best friend, Leslie, who is gossipy, daring, playful, intelligent, loyal, and the relationship between them is stronger than steel, honest affection. James is another good friend of Gwen, a sixteenth-century ghost that lives in her school, a guy who has not yet realized that he is dead and passes shocked by the behavior of boys and girls in school, every encounter with it is pure fun. Gwen's family is like any other family, but if we add that in a single multi-story house, there are living, a grandmother, an great aunt, two unmarried sisters beyond their forties, their sons and daugthers, three of one, and one of the other, and a cryptic and mysterious butler, and add to that, hyper strict grandmother, great aunt has visions, a granddaughter sees ghosts, and other granddaughter, could or not be a time traveler. Pff is madness, situations, fun, tangled, jealousy, cries, jokes, fights, are given on each page, always have something to tell, or some mystery to discover. All the characters are very well written, each has its importance and you get to know them perfectly. Finally there is Gideon, there has to be a hottie, right?, is a bit arrogant for me, but in this part of the series, we come to understand that there is a reason behind his attitude, he is self confident and handsome and has many skills . Despite his attitude, you come to love him and like Gwen confuses you with his actions. This book end is a cliffhanger, and it will left you with so many questions, so surely you will run immediately to Sapphire. In this book we engage more fully in time traveling, and all the training that is required, to avoid causing a riot, or carrying from the future a virus to people that use to die just of a cold. Come along with Gwen and her friends, discovering the mysteries surrounding the lodge of the Vigilant of the time travelers. We met the Count Saint Germain, an evil and maipulator man. We discover not only the secrets of the lodge, but also the ones in Gwen's family. In love everything is give and take, that the only thing that leaves us is with a very broken heart. Gideon is in grave danger and his only hope is Gwen ... although she no longer trusts him. Gwen didn't wanted to be the last time traveler, or having to jump back in time to close the circle of the Twelve (which, moreover, is so secret she no understand), and face enemies willing to kill her life. He preferred to stay with her ordinary life: school, friends and some guy from time to time. However, when she met his traveling companion, the charming Gideon de Villiers, things got much more interesting ... love emerged! But now Gwen is devastated. Just discovered that all the attention the boy was giving to her was just a ploy devised by the dark Count of Saint Germain and fulfill the mission himself. But the move did not work out and now is in the hands of a new enemy: a secret society infiltrated at the home of De Villiers ready to end the time travelers. What should Gwen do now? Redeeming Gideon and fight together to close the circle? Or forget it all and get back to life she has in the XXI century? Here we come to the end of this delightful story, I love the time travels and how they can confuse you, the comings and goings, and how they know in the future whether or not you traveled to the past but have not done so yet, and howin the past is the same Count of Saint Germain the one planning when and how is that you should travel to the past from the future, are you confused? ?, well that's the whole book, which I loved and almost makes you think about taking notes, is wonderful. 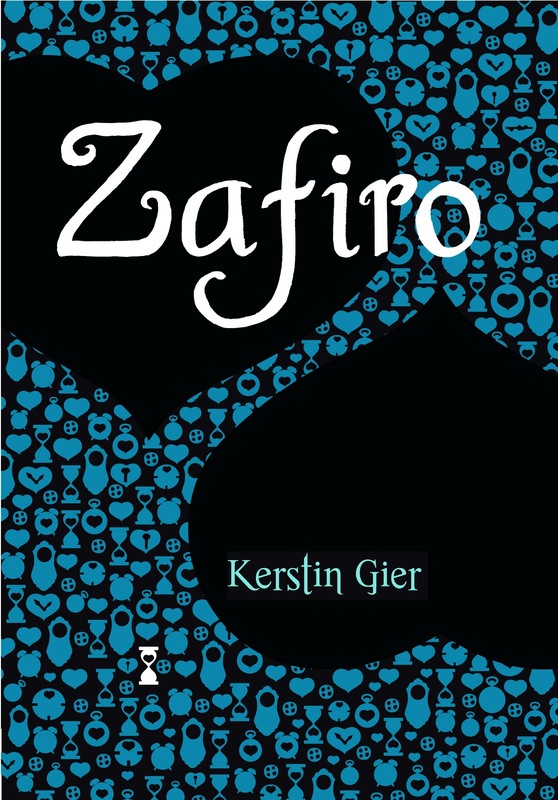 In this book Gwen gets help from his grandfather, who is a young clueless guy in the past. And thanks to him and his eclectic group of friends, Leslie, James, Xemerious, Gideon's brother, Raphael, and maybe a little of Mr. George, a man who is part of the Vigilant; Gwen unveil the mystery surrounding the Circle of Twelve, why her cousin fled 17 years ago, and understand the importance of rescuing the world from the terrible plans of Count of Saint Germain. Will she defeat him without risking her loved ones?, We then read the book to find out! As you may have noticed, I loved these books, they are full of fantasy, action, romance, comedy, mystery and time travelers!, What else can we ask. Really if you wish to read something you must not miss them, and if you think you are too old to read stories like this, well no, you aren't. This series has been so successful internationally, that, in Germany (country of origin of the books) is already being film the first movie, which will hardly reach Latin America, but I think that Hollywood, will seek to do the American version. 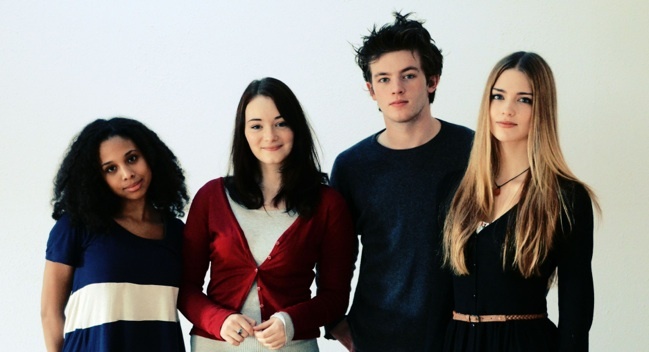 Here is a photo of the actors who will perform as, in order from left to right, Leslie, Gwen, Gideon, Charlotte. Hope you give yourself the oportunity of read them. 50 Shades of Grey, mi opinion.